The CETA trade agreement could lock in water privatisation in England and have implications for Scottish Water. The Council of Canadians has warned that if the Canada-European Union Comprehensive Economic and Trade Agreement (CETA) were ratified, it would pose a serious obstacle to the remunicipalisation of privatised water services in England. That's because the Ontario Teachers' Pension Plan owns 27 per cent of Northumbrian Water Group Plc, which sells its water services to about 4.4 million 'customers' in England, and the Canada Pension Plan owns one-third of Anglian Water Services, which sells water services to approximately six million people in England. The pension funds could use the investor-state dispute settlement (ISDS) provision in CETA to sue for future profits should the water utilities be brought back into public hands by a future government. There is a certain irony here as Scottish Water International has recently won a second contract to advise the Canadian city of Calgary on its water supply. We export public service water expertise to Canada, they export privatisation back! The Scottish Parliament's European and External Relations Committee is currently holding an inquiry into CETA and the EU Commission will be giving evidence to the committee on 4 February. While Scottish Water is a public service, many of its services are delivered by the private sector. As Utilities Scotland previously highlighted, almost all the capital programme is delivered by contractors and a number of wastewater plants are run by contractors under PFI schemes. In addition, the Scottish Government recently handed a contract for public sector water and wastewater services to Anglian Water - who are part owned by Canadian pension funds. This opens the possibility of a future Scottish Government being sued under the ISDS process if they sought to bring all of Scottish Water back into public ownership. This isn't a theoretical risk. In 1999, Azurix, a subsidiary of Enron Corporation, sued the Argentinian government after water supply failures led to a consumer boycott . A 2007 ICSID [International Centre for Settlement of Investment Disputes] tribunal found in favour of the company and ordered the government of Argentina to pay $165 million in compensation. In 2010 the ICSID again ruled in favour of a water company, in a dispute involving the French transnational Suez. This time it was the Argentine government that rescinded the contract, because of concerns over water quality, lack of wastewater treatment, and mounting tariffs. If TTIP was agreed we would have a whole new batch of problems with US firms getting in on the act. The Flint River crisis highlights the risks of privatised water supply. The decision to switch the Michigan city’s drinking water source to the Flint River was aimed at saving $5m, but almost two years later the cost to treat the water supply carries a tag of $45m together with concerns over lead poisoning and contamination. President Obama cited Flint’s water crisis as an example of why the government’s role in public safety is so crucial, He said; “It is a reminder of why you can’t shortchange basic services that we provide to our people and that we, together, provide as a government to assure the health and safety of the American public is preserved". As Food & Water Europe has highlighted; "TTIP, CETA and TISA all pose major threats to many of the victories that civil society has achieved over the decades to make the human right to water a reality and to promote and recover public control over water management. ...[Trade agreements] can make privatisation processes iron-clad. Investment protection mechanisms would allow corporations to challenge processes of water remunicipalisation, the powerful wave of local governments taking back public control over water, like in Paris and Berlin." Much of the focus in campaigns against TTIP and CETA have been on the NHS. Let's not forget that our public water supply is equally at risk. While the political temperature is rising over the fiscal framework negotiations, let’s not forget the Barnett Formula. The fiscal framework is a key element in the devolution of income tax to Scotland. It should establish a mechanism for ensuring the ‘no detriment’ principle outlined by the Smith Commission. Negotiations have been taking place for months between John Swinney, the Deputy First Minister and Greg Hands, the Chief Secretary to the Treasury. The details have been kept largely confidential although we can guess at the difficulties given Professor David Bell’s presentation at Holyrood and the IFS analysis. The political rhetoric went up a gear today with Labour claiming Nicola Sturgeon has created an “artificial deadline” of 12 February and is intent on crashing the process for electoral gain. Ian Murray MP said: “Without full transparency, it would appear to the Scottish people the SNP Government is looking for an opportunity not to implement the Scotland Bill because it’s not in its political interests to have the powers to create one of the most powerful devolved parliaments in the world". In essence, Labour believes that by delaying the fiscal framework, the SNP won’t have to face up to the responsibilities of taxation before the election. I don’t doubt the attractiveness to the SNP of a political strategy that simply focuses on ‘Wicked Westminster’ and allows us all to believe that we can have decent public services without difficult conversations about taxation - Scandamerica as I like to describe it. However, that doesn’t mean that there aren’t real risks in getting the fiscal framework wrong. Colleagues at the Reid Foundation have discussed these in a working paper, but as there is to be a revised paper shortly I will leave it at that for now. Historically, he has a strong point. It means we spend £1,600 per head more than the average in England or about £8 billion. However, will the Barnett Formula continue to deliver in future? In England, the Local Government budget is being cut over £6bn in the period to 2019/20 and the plan is to end the rate support grant in England by 2020, with further negative consequences for the Barnett formula. This year’s impact on the Barnett formula was more than £80m as shown in this table. This isn’t a new problem. Since the privatisation of the water industry in England, Scotland hasn’t had any Barnett consequentials. This has rarely been significant because there is no real revenue support for Scottish Water – the main benefit of public ownership financially is cheaper borrowing. The same can’t be said for Higher Education. The reliance on tuition fees in England means negative Barnett consequentials because our universities don’t have that income flow and therefore UK government has been able to cut their contribution to the additional costs. It’s not necessarily all one way. As I pointed out in my analysis of the Draft Budget, there is a plan to devolve Attendance Allowance (AA) to English councils. When free care for the elderly was introduced the Scottish Government argued that they should get the savings this policy created for AA. Unsurprisingly, the Treasury said no. However, if they devolve this funding there should be Barnett consequentials of some £500m, although it will depend on how that is accounted for in English budgets. All of this is because we made different choices in Scotland and that of course is what devolution should be all about. However, that is the potential problem with the Barnett Formula as we go forward. In simple terms, with Barnett we are tied, financially at least, to English public service reform. With a Tory strategy of slashing the size of the state, this has serious consequences for long term funding. Which takes us full circle to the fiscal framework. The advantage of controlling more of our own taxation is that we are less beholden to Tory policies in England. So, yes of course we need to get that framework right, otherwise it could be a double whammy. However, it also means we need to have grown up conversations about taxation in Scotland and that appears to be equally challenging. 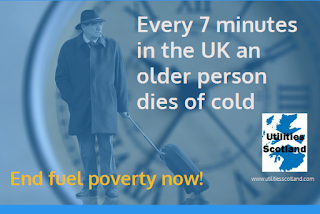 Every seven minutes in the UK an older person dies of cold. He was highlighting the disconnect between the falling price of wholesale gas and the much smaller fall in household energy prices. If this were a competitive market, which reflected the 45% fall in wholesale prices seen over the last two years, the average dual-fuel consumer in Britain would be paying £850 or so a year, rather than the £1,100 charged to most customers on standard tariffs. Analysts at ICIS expect that wholesale gas prices will continue to fall in 2016. The Prime Minister meekly said that bills were “not falling as fast as I would like”. The Energy Secretary has written a stiff letter to the energy companies and Ofgem has wrung its hands as usual. Dermot Nolan, the watchdog’s chief executive said; “we really should be seeing bigger retail cuts. Bills should be cut by around £300 for the majority of people”. And his solution? People should switch. Unsurprisingly, this was also the energy industry’s response on the BBC. The spokesperson there went as far as blaming consumers for not switching. The much-vaunted Competition and Market Authority’s investigation into the energy market has been delayed for a second time, with provisional remedies now due in March and the final report in June. This follows the six month delay announced last September. Maybe they are checking their sums after SSE chief executive Alistair Phillips-Davies publicly accused them of getting their sums wrong last summer when it said the big six suppliers were overcharging customers by £1.7bn a year. The problem is not limited to the Big6. A personal disappointment to me as a member of the Co-op Party was that Co-operative Energy has attracted the most customer complaints ever recorded by Citizens Advice in its quarterly ranking of the best and worst suppliers. The company received 1,584 complaints per 100,000 customers - 40 times more than the best performer, SSE. Sadly, this came as no surprise to me. After very poor customer service I reluctantly switched from the Co-op. The final meter reading was then hugely overestimated and they took more than £2,500 too much from my account through Direct Debit. It has taken months to resolve and so it is easy to see why people are reluctant to switch. In fact seven out of ten consumers don't regularly switch and would rather have a model that offers them an honest tariff, as Patrick Collinson argues in today's Guardian. 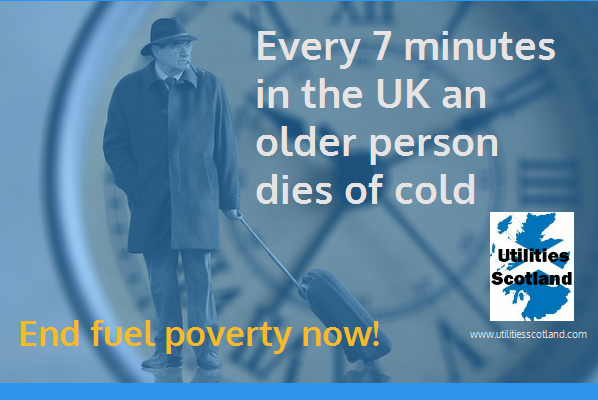 With fuel poverty in Scotland increasing rapidly the independent experts at the Scottish Parliament Information Centre (Spice) have confirmed that the final fuel poverty budget for 2015/16 was £119 million. This is due to fall by £15 million in 2016/17 under the draft Scottish Government budget - a cut of 13%. While this may address energy efficiency, I would point to another solution to rising prices – municipal ownership. Municipal engagement in energy supply could also unlock the potential of local generation and generate a much needed new source of income for local authorities. Last year, IPPR published City energy, a study of this emerging new trend. It showed that many councils are already starting to play a substantive and innovative role in Britain’s energy market – tackling fuel poverty, investing in local clean energy and benefitting the local economy. The energy market has failed. Municipal energy as well as action on energy efficiency is the way ahead for all consumers, but most of all for those dying from fuel poverty. The announcement by Moray Council that they are to consider increasing the Council Tax has highlighted the Council Tax freeze. It is unlikely that many, if any, councils will actually increase the Council Tax, but it has at least sparked a debate about council funding. This is important in the context of a draconian spending review that is cutting the amount government is giving councils by £500m. The Council Tax freeze will be in its ninth year and it was introduced because the Scottish Government’s planned replacement for the Council Tax, a Local Income Tax, crashed. As UNISON and others warned it was neither desirable to add another tax on income, or workable administratively. We explain why in this article. The reform of local taxation is still a live issue and the options are set out in the recent report of the Local Taxation Commission. UNISON’s position is set out in our evidence. It was later argued that the Council Tax freeze was a contribution to the ‘social wage’ – helping family budgets. While it does that, it does so in a regressive way, giving more support to wealthier householders. Band H households are “saving” on average £441 per year while those in the cheapest homes (Band A) “save” £147 a year. In addition, councils have partly plugged the gap by increasing charges for services that also hit the lower paid harder. It also hits women as employees and carers harder, as the recent ‘Close the Gap’ report shows. Most councils are unlikely to increase the Council Tax because if they do the Scottish Government will penalise them financially. For example, Edinburgh would lose nearly £7m. You can view your own council’s penalty in the draft finance circular. This means any Council Tax increase would have to be substantial to cover the penalty and generate significant new revenue. Even if the penalties were withdrawn, an immediate increase would not resolve the coming crisis. A 5% increase in the Council Tax would generate around £100m - helpful, but not a panacea. The problem with the Council Tax freeze is the cumulative impact – over £2.5bn so far. Every year the freeze continues that impact is multiplied. The Council Tax now only generates 12% of council income; it used to be nearer 20%. By dictating almost all council finance from the centre, councils become local administrators rather than local government – unable to respond to local needs and be accountable to their electorate. There is a growing realisation that the Council Tax freeze has had its day. Even George Osborne has allowed English councils a 2% increase to help pay for social care. It may only be part of the solution to the current crisis, the cut in grant allocation is much more significant, but the cumulative impact has been significant. If we want a society which looks after the most vulnerable, then we must stop cutting the local services on which they depend. The Scottish Government can support good quality employment by ‘blocking the low-road’ for employers and ‘paving the high-road’ towards an empowered and healthy workforce. employee engagement in company/organisational decisions. Underpinning all of their recommendations is the need for the Scottish Government, employers and trade unions to work together to drive up employment standards and eliminate bad practice. That starts with a commitment to ‘blocking the low-road’ for employers and ‘paving the high-road’ towards an empowered and healthy workforce. At the heart of this should be a firm commitment towards employee engagement and encouraging the strong management and leadership skills needed to involve the workforce in improving its own wellbeing. They expect the Scottish Government to embed these aims in all of the employment and business support programmes it funds. The report references a number of UNISON initiatives including the Ethical Care Charter. A point made sharply yesterday with the data released by Gordon Aikman on those dying while they wait for care packages. Employers organisations like the Coalition of Care and Support Providers in Scotland (CCSPS) estimated that recruitment costs in the care sector amount to £3,500 for each new worker and that the sector suffers relatively high staff turnover rates. This was confirmed by the UK Home Care Association who said there is an average staff turnover rate of 38%. Another long standing UNISON concern has been the impact of work on mental health in the workplace. The Committee was concerned to see the mounting body of evidence demonstrating the link between low quality work and negative health outcomes. They urged the HSE, government and councils to explore how the monitoring and reporting of mental health impacts in the workplace could be made more effective. The Committee also recognised the damaging impact the Trade Union Bill could have quality employment and in particular employee engagement. They said: “We believe that any further restriction on trade unions in fulfilling their longstanding roles, such as contained within the Trade Union Bill, would be damaging”. This report is a useful analysis of quality employment that recognises the problem of definition and poor Scottish labour market data. However, they resisted the temptation simply to call for more research. Instead, they set out a roadmap towards better employment standards. This should inform the work of the Fair Work Convention and UNISON Scotland submitted its ideas to that body this month. There is a broad consensus on the way forward; the next stage is to turn that into action. Social care is delivered by people, informal carers and workers, not robots. This means improving the quality of care in Scotland has to seriously address workforce issues. Let's start by understanding the workforce. 189,670 people are employed in the social care sector, which accounts for approximately 7.4% of Scottish employment. The typical weekly hours worked by staff is close to full-time at 32.5, with women accounting for 85% of the workforce. The biggest employer is the private sector with 41% of the workforce. The public sector makes up 31% and the voluntary sector employs 27% of the workforce. This is a growing workforce as demands on the sector grow. However, all providers report increasing difficulties with the recruitment and retention of staff. Part of the reason for this is the precarious nature of work in the sector. While the workforce is predominantly employed on permanent contracts (79%), there are significant numbers (around 12%) employed on Zero-Hours contracts. This number understates the actual level of precarious work because of the prevalence of Nominal-Hours contracts. These are contracts where staff are contracted to work a set number of hours, but in practice work significantly more. The biggest immediate problem is pay. The vast majority of care workers are employed in Class 2 (entry level) care worker positions which covers routine care and support work and which typically pays the National Minimum Wage (NMN) (£6.70 over 21) or just above. Shockingly, some providers even attempt to avoid their legal obligations to pay the NMW. For example last week UNISON won a victory over MiHomecare. Staff there were notionally paid the legal minimum, but the company did not pay for the time they spent travelling between clients’ homes — meaning that they received less than the minimum wage. There have been efforts to establish an industry floor of £7 an hour in Scotland, but this has run into some legal difficulties over State Aid provisions. It has also been overtaken by events with the introduction of the new UK National ‘Living’ Wage set at £7.20 for workers age 25 and over from April 2016. There is an agreed ambition from stakeholders to see all employers in the sector become Scottish Living Wage employers – currently £8.25 in Scotland. The latest Scottish Government statutory procurement guidance on workforce matters sets out how this can be achieved legally through procurement. The wide support for this measure recognises that the payment of the living wage and a general improvement of terms and conditions will be required to deliver a social care workforce consistent with our aspirations for quality care. Of course fair remuneration is only one aspect of fair work. UNISON’s Ethical Care Charter is referenced in recent Commission reports and the Scottish Government’s vision for social work. The Charter covers, training, induction, zero-hour contracts and time to care properly - as well as payment for travel time, travel costs, occupational sick pay and other necessary expenses such as mobile phones. We published a new briefing on the Ethical Care Charter last week and how all councils in Scotland could implement it. The barriers are no longer legal, they are largely financial. The Scottish Government's draft budget makes some provision for additional funding routed through the NHS budget. However, it remains to be seen how much of this actually reaches social care services given the pressures on NHS provision. Even George Osborne recognised the problem in allowing English councils to raise the Council Tax. There is no such relief in Scotland where the regressive Council Tax freeze drags on, together with further cuts to council budgets. At today's conference there was a recognition that we need to raise the profile of social care to get the same level of public, and then political, support as the NHS. With a growing elderly population, increasingly socially isolated, there is some enlightened self interested to be tapped into here to build the case for proper funding. Social care is a universal good that we will all need at some stage, part of the fabric of the society we want to see. We also have to debate if there should be at least a national framework, if not a national service, for social care. Finally, care workers also have strong views about the quality of care. A UNISON survey of Scottish homecare workers exposed the shocking reality of the country’s care services. The majority of workers polled in the survey - Scotland: It’s Time to Care – said that the service is not sufficient to meet the needs of the people they care for, both from the time they can spend and the quality of care they can provide. Social care plays a vital and growing role in our society. Yet increasing demand, falling real terms funding, and increasingly complex care needs has put the sector under significant strain. At the heart of this cocktail of challenges sits the workforce, which experiences low wages and poor working conditions. Most care workers are highly committed to the work they do, but such conditions are putting them under significant strain. If we want a social care system that can meet the needs of our ageing population and treat recipients in a dignified way, then we need to invest in the workforce that provides it. 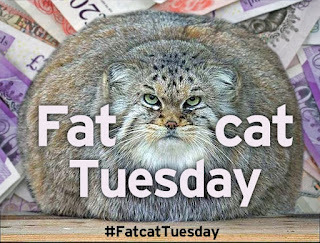 On the day most workers in Scotland returned to work, FTSE100 CEO’s had already been paid more than the average worker will earn this year. 71% agree that CEO pay levels in the UK are generally too high (while only 5% disagree). 64% disagree that CEO pay levels in the UK inspire employees to work hard (while only 8% agree). 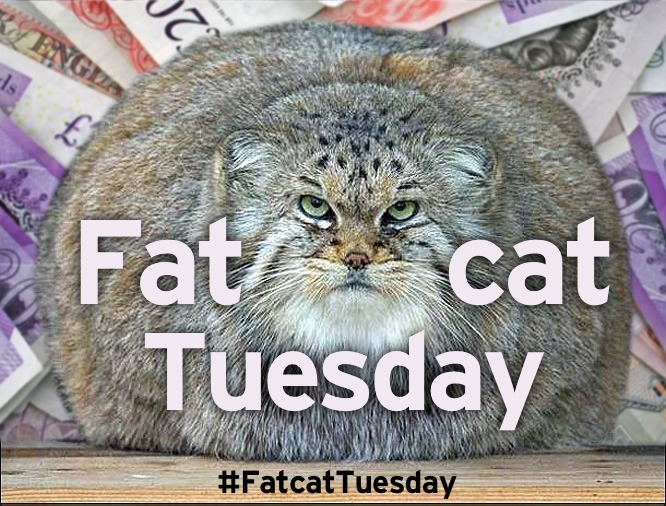 60% agree that CEO pay levels in the UK demotivate employees (while only 13% disagree). 54% agree that CEO pay levels in the UK are bad for an organisation’s reputation (while only 11% disagree). Not for the first time the gut reaction of workers is spot on. There is little evidence that paying more results in better management. One solution is to make it a requirement that organisations publish their pay ratios. This would automatically integrate pay at the top into an organisation’s formal pay scale. Peter Marsland explains how this can be done in the High Pay Centre’s recent publication ‘Pay Ratios – Just Do It’. He demolishes the standard arguments against this approach – it’s too difficult, to onerous. This is data employers should have, and calculating the ratio ought not to challenge anybody with a decent pass in National Grade maths. Peter doesn’t go as far as recommending a particular ratio, arguing that all organisations are different. The primary aim is transparency and even in the free market USA, the Securities and Exchange Commission supports this approach. Those organisations who have adopted a ratio have taken pretty high figures. For example, at John Lewis it is 75:1, at the TSB 65:1. Just before Christmas, the Scottish media reported that there are at least 64 employees in the Scottish Government, its quangos and other public bodies being paid a minimum of £100,000, according to statistics obtained by the Scottish Greens. In fairness, most of these senior staff manage large organisations and their pay ratios are well below their private sector equivalents – a 10:1 ratio wouldn’t cause much pain at the top of the Scottish public sector. Even so, there have been efforts to copy the private sector in recent years with the introduction of bonus systems. The voluntary sector has come under similar scrutiny. The evidence that staff are less productive in organisations that have big gaps between top and bottom pay and where decisions on pay are felt to be unfair also applies to the public sector. Interestingly, the CIPD survey asked respondents about ratios of 5:1 and 10:1 – far removed from the private sector norm. The growing problem of high pay reflects the damage inequality does to our society. It also damages organisational performance and the reputation of organisations. Improved transparency through the publication of pay ratios is an important starting point. However, while one size shouldn’t fit all, maybe it is time for the Scottish public and voluntary sector to lead the way by establishing pay ratios. Perhaps something the Fair Work Convention should be considering? Happy New Year! Lets hope 2016 will be a better one for everyone, but that may be the triumph of hope over reality. Despite much hype from the Chancellor, the real economy is still struggling to recover from the slowest economic recovery from recession since records began. That is particularly true for wages. As today’s TUC analysis shows, the average weekly wage is still £40 a week below its pre-crisis level – the equivalent of over £2,000 a year. It will take until 2018 for average earnings just to get back to the real value they held before the crash - a lost decade. The latest ONS wealth data shows that the recovery is not fairly shared – putting Cameron’s absurd Christmas and New Year messages in context. The rich are getting richer, with the top 10% now owning 45% of total UK household wealth. While the poorest face social security cuts and low wages. 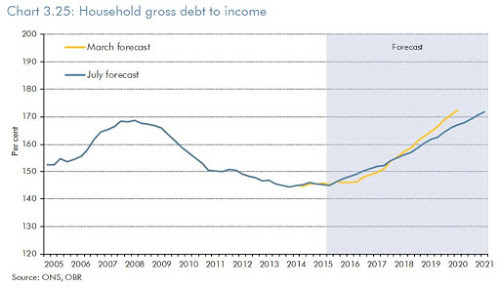 A particular concern of mine for 2016 is the growing reliance on household debt to sustain the economic recovery. In my analysis of the July Budget, I drew attention to a scary chart buried away in the OBR report. 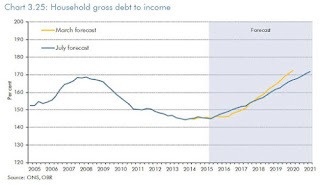 Before Xmas the latest OBR forecasts showed that households have moved from a surplus of £67bn in 2010, the year the coalition took power, to a £40bn deficit this year. This level of borrowing is on course to near the levels reached in the run-up to the 2008 financial crash. Not only has Osborne failed to rebalance the economy, but also he has clearly learned nothing from recent economic history. In Scotland, 2016 is an election year. That is an opportunity to grasp some new thinking, but also a risk that the key issues, particularly taxation, will be fudged a little longer. The key issue for me is local government. In the short term we simply cannot go on pushing Tory austerity down to councils. In the medium term we have to find a solution to local taxation – the Council Tax freeze is unsustainable and with the cuts are doing enormous damage to local services. It is our roads, schools, libraries and care of older people that are suffering. There are at least some positive signs that local government is beginning to find its collective voice. For far too long managerialism has dominated the leadership of councils – I hope that in 2016 they will regain their political voice. While there is a lot of sound and fury over the NHS in Scotland, it is all too often over the wrong issues. Again, we should be focusing on preventative spending, tackling health inequalities, rather than squabbling over waiting times. For those looking for radical solutions I would point to the report of the Commission on Health Inequalities. The real immediate health crisis is over social care. Leaving older people in hospital at five times the cost makes no economic or care sense. Providers are struggling to recruit and retain care staff and corners are being cut in the quality of care. Paying the Scottish Living Wage and delivering the other elements of UNISON’s Ethical Care Charter should be a priority for 2016. 2016 will see new leadership at the troubled PoliceScotland. This is an opportunity for the Scottish Government to abandon its cosmetic police officer target and allow the force to adopt a balanced staffing policy. The financial challenges are big enough, without having to backfill civilian posts with police officers at twice the cost. Finally, the number one campaign for unions will be the Trade Union Bill. While we deal with the detail of the Bill as it goes to the House of Lords, let’s not lose sight of the political intent behind the Bill. It’s not just about neutering trade unions – it’s about creating a different workplace culture in the UK. Elsewhere, I have described this as the Amazon Bill, an attempt to make workers a disposable commodity. We need to work together to address these threats, building alliances whenever possible, together with strong industrial and political campaigns. In particular, I would urge the 'Blairite Tendency' to get over Jeremy Corbyn’s victory and expend more effort fighting the Tories. For public services in particular, 2016 looks like another tough year with pay restraint and big cuts in local services. The Trade Union Bill is of course an attempt to weaken the industrial and political opposition to the downsizing of public provision. The Labour Movement will need to be at its very best to face up to the challenges this year will bring – we can do it! P.S. At least Fulham has a new manager at last in Slavisa Jokanovic, and from the Balkans, my favourite part of Europe as well! Come on Ye Whites!